Reason for Reading: Marg made it sound interesting. In this incandescent debut, newcomer Amy Plum has created a powerful paranormal mythology with immortal revenants. The Paris setting comes enchantingly alive as a relentless struggle between good and evil takes place in its streets. Rich with romance, atmosphere, and thrills, Die for Me will leave readers breathlessly awaiting its sequel. I am not sure I would have rushed out and read this based on the description, but Marg's recent review made it sound interesting. I liked the fact that the book is about immortal revenants. In a world of vampires, werewolves, ghosts, etc, it is always nice to see an author tackle something different. And, in some ways, this book is different. A revenant is a person who died saving someone else. It doesn't happen to every person, but sometimes when this happens the person is gifted with the power to come back to life over and over again. When they die as a revenant they come back as the same age as they were when they died. If they don't die for a while; they age like a regular human would. This was a fresh spin in the paranormal world. Then, there were things that really were not all that surprising. It turns out that there are revenants that are not so nice. They murder, talk people into suicide, etc. This means that there is the classic battle of good vs. evil. When the two groups come together near the end of the book to clash, I wasn't too disappointed. It was a bit predictable, but made for a page-turner. The big issue that is so much like other young adult books out there right now is that guy meets girl, maybe there is a bit of drama, but then guy and girl are obsessed with each other. Kate is the main character in this novel. Her parents have died and she is living in Paris with her grandparents. She is not taking the death of her parents well. Her family is beginning to worry about her. Enter Vincent. Even though she is a bit resistant in the beginning, she quickly comes around and discovers just how much she cares about him. He vows that he will not die, so they can grow old together and she won't have to worry about him dying all the time. I just do not understand this plot element in young adult novels. I am not sure, maybe I missed something, but this is not the way it works in real life. This is just more spin-offs of the Cinderella ideal. It gives young girls unrealistic expectations. And, honestly, what parent wants their teen obsessed with a guy? Now, while I do have some issues with the predictable romance, I did have to say that Kate is a pretty good character. She is strong, which is shown ten-fold in this book, smart, and if the need is there, capable of standing up for herself. In all other ways than the romance angle, I really like her. The book was readable. I had fun with it and I am looking forward to the sequel, so while I didn't love it because of a few minor quibbles, I am still glad that I read it. It is probably just me, but I am just finding that all YA books lately are underlaid by the same basic story. I keep telling myself I need to just stop reading them for a while, but never seem able to do that. Even the tile for this book is a bit melodramatic. Also, the book takes place in Paris, which I love, and has an eye-catching cover. I mostly recommend this book! This book counts for the R.I.P. Challenge. This sounds pretty good, but another series? I don't know if I can handle another one, I can barely handle the ones I've started! LOL If the library has it, I may check it out though...that whole revenant thing sounds kinda interesting. Love the "mostly recommend" -- describes a lot of the books I read. That cover is super eye catching - love it! And I'm with you, I love books set in Paris. I am glad that you enjoyed it enough to mostly recommend it! I figure it is the kind of book that you don't regret reading for fun! 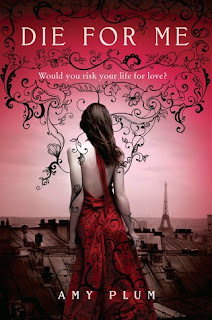 I like the setting of Paris, but not sure I'd enjoy the paranormal romance. I've seen this one around alot and while I like the idea of revenants I am wary with YA titles. I listened to this one on audiobook and really enjoyed hearing the French accents. By the end of the book I felt that the second one was going to be better somehow. I'm sort of excited about it. Lol. I agree the plotlines of a lot of YA books are pretty similar but luckily I like this formula :) Glad you had a fun read with it.